Even "unexplained" weight gain comes from somewhere; medical weight loss doctors can identify the cause of your weight gain and help you address it with medical weight loss. Please call (914) 245-3056 or request more information online. Weight gain can occur even in people who appear to be healthy and maintain regular exercise. That’s because there are a number of weight gain causes that can contribute to this increase. A combination of these causes can even lead to obesity, which can be life-threatening. Some fluctuation in weight is completely normal and may just stem from fluid retention or water retention. When that's the case, you can expect this weight gain to take care itself with a basic combination of diet of exercise. 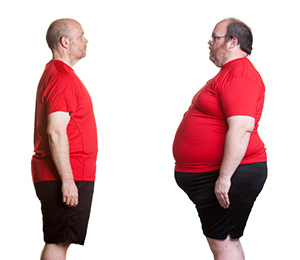 The most effective weight gain treatment is with a medical weight loss program. Unlike fad diets, surgery or trendy exercise videos, medical weight loss is backed by medical research and knowledge. Much of losing weight is based around building good habits, such as eating right and getting a full night’s sleep. Your doctor may analyze your lifestyle to uncover the root cause of your weight and provide a solution that’s customized to your needs. Don’t let weight gain control your life. If you're unsatisfied with your weight or worried about your long-term health, please call (914) 245-3056 or request more information online.